In a “miracle” that has stunned one of the world’s fastest-aging societies, a 61-year old Japanese woman has given birth to her own grandchild, sparking renewed calls for the entire process of surrogacy to be banned in Japan. The unnamed woman, who is now thought to hold the record as the oldest Japanese woman ever to give birth successfully, undertook the controversial treatment at the Suwa Maternity Clinic – an institution that has already sparked fierce debate over the rights and wrongs of surrogate motherhood. Despite the evident joy and relief of both mother and daughter, there remains a strong vein of disapproval over surrogacy in Japan: there is currently no legislation specifically outlawing the practice, but a panel convened by the government earlier in the year recommended an outright ban. It went further, demanding punishments for everyone involved in the surrogacy except the mother herself. Yesterday’s successful treatment involved the woman having her daughter’s already fertilized egg implanted in her womb. The entire family is understood to have agreed to undergo the process, despite its difficulties, because the woman’s daughter was born without ovaries and unlike many young women in Japan, was keen to have children. Doctors at the clinic suggested that while the woman may be the oldest to have successfully borne her own grandchild at Suwa, she is far from the first. The clinic has so far created four other mother-grandmothers, all of them at least 55 years old. The doctor who runs the clinic, Yahiro Netsu, has been an ardent campaigner for surrogacy, sat on the panel that met earlier in the year, and insists that the process of using mothers to carry their own daughters’ babies to full term has not generated any serious problems. 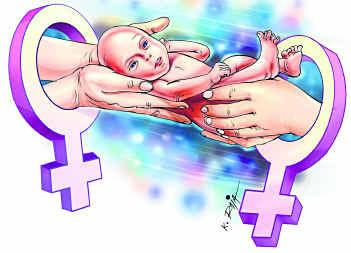 The panel concluded at the time that the “physical and mental burdens” imposed by surrogacy, along with the supposedly complex legal questions of parentage, made it undesirable. Dr Netsu argued that surrogacy should be an available treatment to all women with severe fertility issues. The birth at Suwa comes as the Japanese government is only just beginning to acknowledge the enormity of its fertility and birthrate crisis. Analysts speak of a “demographic timebomb” that will explode as the population ages beyond the economy’s ability to support itself, but many believe that the pain has already begun. The government, meanwhile, is rapidly running out of ideas for how to reverse the trend. It has dawdled on birthrate policy for many years, and been forced to watch as the fertility rate – the average number of babies born to each woman of child-bearing age in Japan – has sunk to around 1.32. In parts of Tokyo, it has even dropped below 0.99. In sharp decline for nearly 35 years, Japan’s birthrate has held below the critical replacement level of 2.1 children per couple since 1974. Strong social and political resistance to immigration mean that Japan’s population crisis has not been cushioned – as it has elsewhere in the developed world - by successive waves of newcomers.